I recently had the pleasure of taking an amazing European family vacation. We began our travels with a flight to the Rome Airport (Fiumicino) so we could embark on our Italy travel itinerary. We spent our first two nights in Italy at the Hilton Garden Inn Rome Airport Hotel (which they were gracious enough to provide at the press rate). I thought I’d share my review of the hotel with you here as well as why we chose this Rome airport hotel. We enjoyed our stay very much so I am happy to share our experiences with you here. 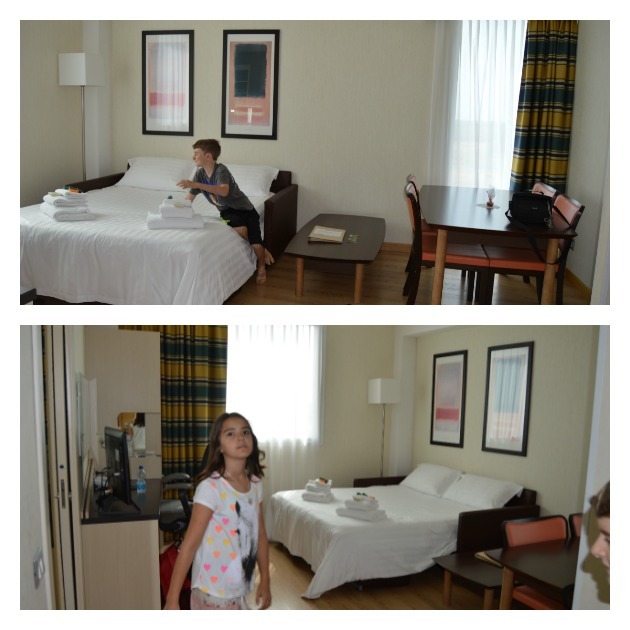 We decided to stay at the Hilton Garden Inn Rome Airport Hotel for several main reasons. As you might guess, reputation did factor into our decision. With the Hilton Garden Inn name, I can expect a certain standard of service and room at a fair price. As it was our first stop in a new country for our children, it was extra important to me to have a great first night stay. 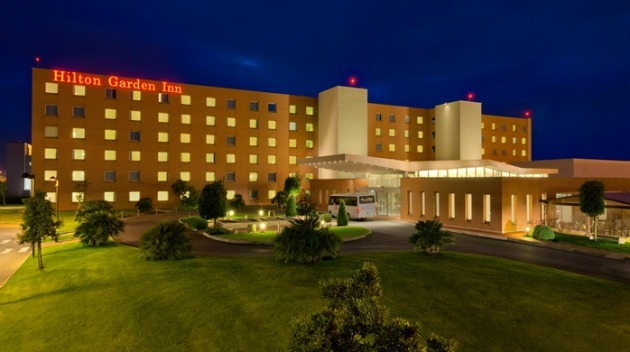 Located just about 2.5 miles from the Rome airport,the Hilton Garden Inn Rome Airport Hotel is very convenient. The Rome Airport, Fiumicino (Leonardo da Vinci airport of Rome) is located a fair distance from Rome itself and before we headed to downtown Rome, we had two reasons to select a hotel near the Rome airport. The first reason was that we were arriving late and night and we knew we needed to get some good rest after our long travels as soon as possible! The second reason is that we wanted to head out to visit the ancient Roman city of Ostia Antica the next day before we journeyed into Rome itself. 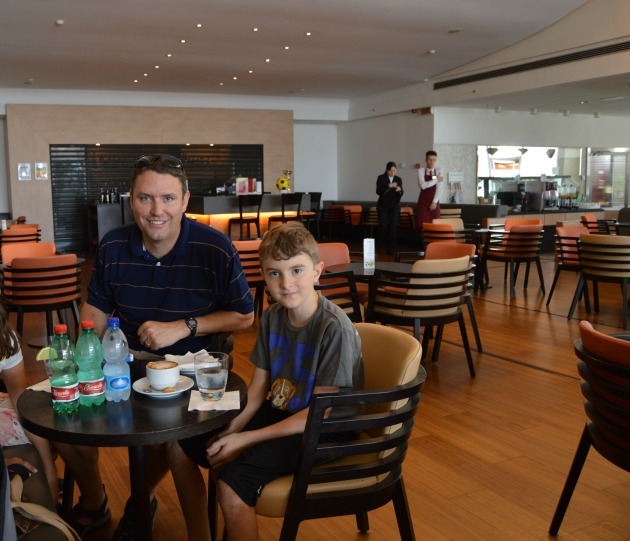 We stayed at the Hilton Garden Inn Rome Airport Hotel for a second night after our Ostia Antica trip to enjoy a final night of great accommodations at a reasonable price before heading into Rome. Oh and we made use of the free shuttle for a smooth trip to the hotel even when we arrived super late at night. They have all the things that make it feel like you haven’t even left home. I made good use of their Business Center to finish up on last minute business (that always seems to come up when you step away). I loved having access to good, strong free WIFI (in our hotel room as well) and being able to print up a few papers we needed for our travels in the Business Center. There was a reception lounge area with TVs and a bar where you could have a cappuccino or a night cap. Our rooms had a refrigerator, coffee maker, and microwave. There was a good desk work area with a comfortable chair and a safe in each room. The bathrooms came complete with the usual goodies (shampoo, conditioner, body wash, and soap). Families can even request a crib or highchair. It was handy that they have an Automated Teller (ATM) on the premises so we could make a withdrawal in Euros and not have to worry about where to find a bank. The staff was all multi-lingual so I didn’t have to worry about not speaking much Italian. They had a on-site convenience store and an on-site restaurant. We had breakfast there both mornings. It was so good. The buffet of popular breakfast items including homemade waffles was extensive and fresh. They had American style items as well as Italian so it was fun to be able to try a few new things and as well as great to have our favs from back home. 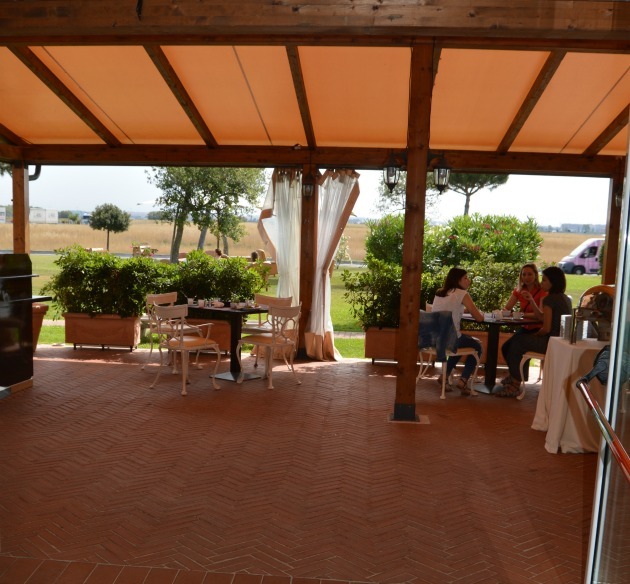 They also had an adorable outdoor eating area which really made you feel as though you had arrived in Italy. I really liked being able to fuel up on a delicious and nutritious breakfast for our family before heading out to a full day of exploration. You can get a family room suite or two adjoining hotel rooms. We tried both options since we stayed two nights and I wanted to be able to share with you the pros and cons. 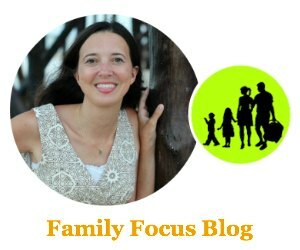 Our kids are 9 and 11 and both options worked well for us since they are at a more self-sufficient age where I can trust them. 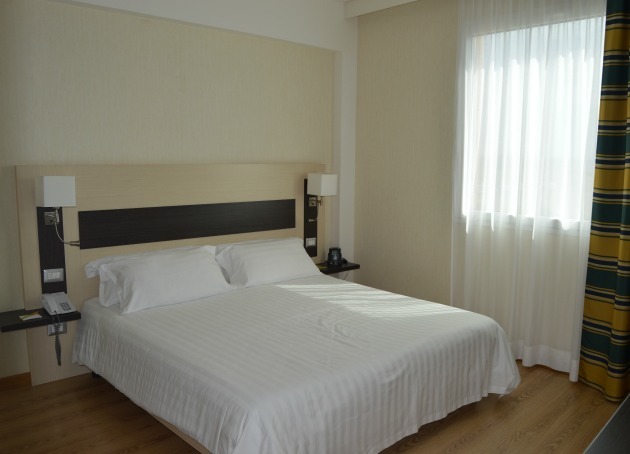 I think we all preferred the two adjoining rooms because the kids each had their own bed instead of a sofa bed to share, and because of the sound privacy being superior in the adjoining rooms. However, if my kids were younger, I would have preferred the family room suite for keeping a better ear on them. The family room suite also offered the extra living room space but we were gone most of the day so that didn’t matter as much to us. The Hilton Garden Inn Rome Airport rooms were all up to date, spacious, and extremely clean. The bathrooms had bathtubs (not just showers) and they had good water pressure. I recommend this Rome airport hotel wholeheartedly. Find out more or book your stay at the Hilton Garden Inn Website. Do you have any questions about the Hilton Garden Inn Rome Airport? Let me know and I’ll see if I can answer them for you. Also, be on the lookout for my post about what to do and see in Rome, coming soon! Curious about the other restaurants at the hotel — were there any? And what did they serve? Hi Erica. There was only one on-site restaurant. I only ate breakfast there but you could also get lunch and dinner. They served Italian and international cuisine. Thanks for asking!